I hate mornings, and the longer I can stay in bed the better. If you're the same, I'm sure you've experienced one of those days where you push snooze one too many times, leaving no time whatsoever to get ready. Whenever this happens there's a certain makeup routine I do which I attempt to finish in around five minutes. Honestly, it's probably more like ten as I'll usually end up smudging something (notice the lack of eyeliner? There's no way I'd attempt that when I'm panicking! ), but regardless this is definitely what I throw onto my face when I'm in a rush. I keep it fairly simple, and I'll throw concealer and powder in my bag for later on in the day. When it comes to the base, I'd rather pop on a primer and skip powder. 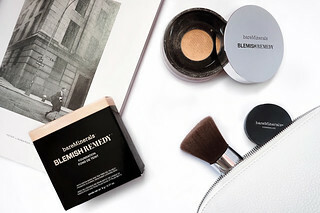 I've been loving the bareMinerals Blemish Remedy Mattifying Prep Gel which was a favourite of mine last summer, and now the weather's getting a little warmer my oily T-Zone needs all the help it can get! The best thing about this primer is definitely the texture - the gel-like consistency is so lightweight and it feels really cooling on the skin. Afterwards, I'll apply one of my favourite tinted moisturisers, bareMinerals Complexion Rescue, and if I feel like I need concealer under my eyes that day I'll reach for my trust Collection Lasting Perfection concealer in Fair. There's certainly no time to contour, so for cheeks I like using a blush with a warm undertone so I can skip bronzer without feeling ghostly. 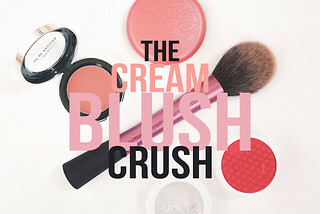 Stila's Convertible Colours are some of my favourite cream blushes, and the shade Cameilla is beautiful. I pat a little bit on, blend with my Real Techniques Miracle Complexion Sponge, then apply Becca's Shimmering Skin Perfector in Opal on the top of my cheeks and along my nose. I love Pearl too! The key to completing my makeup in under five minutes is to create a really simple eye look. I'll use my face primer lightly across my eyelids so I don't have to apply an eyeshadow base, and I'll ditch the liquid liner. My go-to palette is the Zoeva Cocoa Blend palette, and I'll wash the lightest shade Bitter Start across the lid to even everything out, before using a fluffy brush to add some dimension in the crease with my favourite light brown shade (ever), Substitute for Love. For mascara, I'm trying to use up all the minis I have in my collection, and most recently I've been trying Urban Decay's Perversion mascara. It hasn't blown me away, but it does separate lashes beautifully and adds a little bit of volume too. 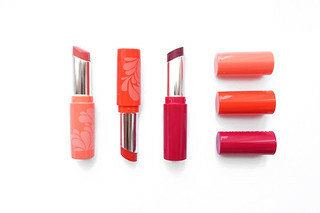 For lips, I'll either apply a balm or add a touch of colour with gloss. Now summer is on the horizon I'm starting to love coral shades again. Revlon's Kiss Me Coral is one I keep in my bag with me at all times, but if I fancy something more neutral I'll pat Stila's Convertible Colour in Cameilla on my lips. Do you have a quick and easy makeup routine? I'd love to know what you use, and if you have any favourite multitasking products!